8 rec. 159 yards. 19.9 avg. 1 TD. Alabama, you can't just key on Knowhson and hope to win anymore. You may have Julio, but we've got AJ and we wouldn't have it any other way. It is obvious that the game plan has now shifted to getting #8 the ball as much as possible. The first play from scrimmage shows that. I'm still not 100% sure what our identity is on offense, but Green is a different kind of WR than we've maybe ever seen at UGA. I can't help but think that we're getting our Calvin Johnson, just a few years later. I wonder if he stole Coach Erickson's wallet during the game. Man he has got some sticky fingers. Except unlike the Calvin situation, we have somebody who can actually throw the ball to him. All things considered, it was a great game. Of course we had more opportunities, if you're anxious to criticize, but you can say that every week. 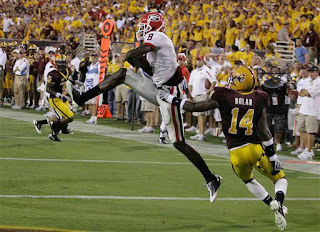 The fact is the Dawgs won by 17 over a good ASU team. The breakout for Green couldn't have come at a better time. Mo is good, but I always hold my breathe when the ball is thrown his way. Last night, I didn't get that feeling with Green. Alabama can stuff the run, as seen against Clemson, if the pass game is of little concern. Now however against the Dawgs... The ground game cannot be the only focus. My guess is Bama was feeling pretty good in the back of their minds about the upcoming matchup prior to Green's breakout. Now that they see UGA has a serious receiving threat? Is it me, or does AJ look eerily similar to Randy Moss?